Composer Victoria Bond and librettist Myles Lee have collaborated on a most unusual and worthwhile project, one that marries text and music to commemorate four of America’s greatest Presidents. I had an opportunity to query them about their novel collaboration in July of 2018. I will attempt in the interview below to make it clear to whom each question is addressed and when both of them reply to a question, who it is that answers. Victoria, with musical parents and even a grandfather who was a composer, were you destined for a musical career from birth? Did you parents encourage you in your pursuit in that field? VB: I come from a long line of musical forebears. Not only my parents, but my grandparents on both sides were all musicians. It was inevitable that I became a musician. I even rebelled briefly against this inevitability, wanting to explore other arts, such as painting, sculpture, and theater, but in the end, I came back to music—the pull was too strong. My mother was my first piano teacher, and continued to support me throughout my career. My father, who was a professional singer at the New York City Opera as well as a medical doctor, was a bit more skeptical as to whether or not I could make a career as a conductor, but when I invited him to sing arias from Mozart operas on a concert with one of my orchestras, he was won over. So, how old were you when you decided to become a composer? VB: I wanted to be a composer from the start, before I could read music. I didn’t know what the word composer meant, but I liked to make up stories and paint pictures with sound. I improvised from the time I could reach the keys, and my kindergarten principal reprimanded my mother, whom she thought was forcing me to practice. When my mother told her that I was not yet even taking piano lessons, she recanted. How old were you when you wrote the earliest piece that you have retained in your “official” catalog? VB: All of my earliest work has been lost as we moved from New York back to Los Angeles where I was born when I was 16 and took none of my work with us. So nothing predates my 16th year. You’ve certainly had some illustrious teachers, including Roger Sessions, Ingolf Dahl, Nadia Reisenberg, and Herbert von Karajan. Could you speak about what you learned from them? VB: All of these people were hugely influential in my development as a musician. I studied with Ingolf Dahl at the University of Southern California, and he impressed me as a complete musician—composer, conductor, pianist, and teacher. His lessons stressed form, analyzing the masterworks of the past, and gaining technical skills. He sparked my love of counterpoint, for which I am eternally grateful. I studied privately with Paul Glass after graduating from USC. At the time Paul was writing film and television scores, and although he had a thorough background as a symphonic composer, he also had the facility to turn out brilliant music that captured the mood of a film and to do it overnight. I learned how to work on a deadline, and assisted him in orchestrating, arranging, and ghost-writing scores for Metromedia, Paramount, and Universal studios. Hearing the music I composed the night before played by the finest studio musicians the following day was positively exhilarating! I studied with Roger Sessions at the Juilliard School, and benefitted from his vast knowledge, acute observations, and no-nonsense approach. When I brought an experimental score to one lesson, explaining the idea behind it, he said, “Music is made of notes, not ideas.” He was not impressed with abstractions—he just wanted to know if the notes worked. I studied piano with Nadia Reisenberg after my lessons with my mother, and remember her as a teacher with very high standards and expectations. I was fortunate to study conducting with Herbert von Karajan during my last year at Juilliard, when he came to give a week of masterclasses. He was very demanding and a superb teacher. He demonstrated the acuteness of his ability to listen and articulate what he heard, targeting with laser-like accuracy what he wanted to correct in the orchestra. He gave me a new standard to live by, and I think of his lessons every time I conduct. How do you juggle equally successful careers as a conductor and composer? VB: My conducting career took off after I graduated from Juilliard and was appointed Exxon/Arts Endowment Conductor with the Pittsburgh Symphony. Being placed with a major symphony orchestra and given the opportunity to conduct it regularly, as well as to guest-conduct orchestras throughout the United States, gave me valuable experience with the professional world. It did mean, however, that my work as a composer took a back seat to that of a conductor, as I had little time to write. This situation continued for several decades, until I finally decided that unless I made a dramatic change in my lifestyle, I was not going to get written what I had in my head. So I changed from being a conductor/composer to being a composer/conductor, and I am very glad to have made that decision. I left two full-time jobs, one as music director of the Roanoke Symphony and one as artistic director of Opera Roanoke, moved back to New York where my husband lives, and spend the majority of my time writing. I still do conduct, and have a regular position as principal guest conductor of Chamber Opera Chicago, and I still do guest-conduct, but the volume is nothing like it was when I was on a plane weekly going to rehearsals and performances and commuting back to see my husband in NYC. Myles, how did you meet Victoria? ML: We met by completely by chance at 7 a.m. during a New Year's Day walk in 2004. Since few people are vertical at that early hour on that particular day, we stopped to exchange pleasantries. Common interests rapidly became apparent. Later, in my library, which has 20 shelves of books on American history and the presidency, Victoria mentioned she, too, harbored an interest in American history, having written an opera on the Constitutional Convention of 1787 (A More Perfect Union) and another on Victoria Woodhull, the first woman to run for president in the U.S. in 1872 (Mrs. President). Looking at my collection on Washington, Victoria asked if I had heard Copland’s Lincoln Portrait. No sooner had I uttered that I was familiar with it then she turned to me, saying, “We should do a Washington portrait!” Stunned, I could only reply, “Victoria, I’m an historical hobbyist. You want a real pro to do this!” Pointing her finger at me, like the conductor she is demanding a response from a musician, she said, “No! I want you!” The rest is history. And here we are! Victoria, needless to say, instrumental concertos including narration, of which you offer four on the CD under discussion, are very unusual. May I ask what or who gave you the idea for composing these works? VB: I have always admired Aaron Copland’s Lincoln Portrait, and felt that there were other presidents whose inspiring and visionary words and deeds would lend themselves to a similar musical treatment. In addition to the narrator, however, I wanted to further enhance the music by including a solo instrument associated with the president’s time or personality. In the case of George Washington, the music incorporates fife and drum tunes from the Revolutionary period, so I chose the flute; as Jefferson was an avid violinist, the solo instrument was the violin; the trumpet seemed well suited to Theodore Roosevelt’s exuberant personality, and the clarinet was the instrument of choice for Franklin Roosevelt, as the music references the big band era and Benny Goodman. Myles, did you initially set out to collaborate on a series of four concertos with narration, or did the success of the first one lead to the others? ML: The success of Pater Patriae encouraged creation of the others. During the writing of that piece, I made a very cold call to the late James Rees, then executive director of Mount Vernon. As a result of that call from a virtual voice in the wilderness, Mount Vernon donated its new underground theater to us for rehearsing and the performance, printed the programs, invited the guests, and had a party for us on the piazza overlooking the Potomac. We also had run of the mansion. That was in September of 2007. It was, for me, the thrill of a lifetime. Clearly we had to do another! These are obviously patriotic works. Given the increasing and seemingly unbridgeable gulf in our society between the right and the left (I don’t believe that the Latin phrase e pluribus unum describes our nation any longer), what function can patriotic works such as these have in our country? ML: That’s a great question, and one very pertinent to my relationship with Victoria. What you must understand from the outset, and might not believe, is that Victoria and I are at opposite ends of the political spectrum! But what we knew, even in 2007, was that these pieces were going to be portraits of presidential character, not political statements. We were going to try to humanize our subjects by focusing on a single aspect of character, to document not their accomplishments, with which most are familiar, but the inner turmoil and conflict each man confronted on his journey to immortality. We chose our subsequent subjects from a group we both considered to be undeniable game changers in geopolitical history. They are all represented either on the Mall in Washington, D.C. or on Mount Rushmore. The perspective of history provides that validation. That two political antagonists, such as Victoria and I are, could, over a period of 14 years, produce an album such as this, that embraces a broad spectrum of American geopolitical history is I think a tribute to what can be accomplished by two committed people even in today’s unusually confrontational milieu. Perhaps unwittingly, I think we are both disciples of George Washington’s Rules of Civility and Decent Behaviour in Company and Conversation, compiled around 1745 by Washington at the age of 13 from a 1595 source attributed to French Jesuits. Washington lived by those rules, so do Victoria and I, and so should those in power today. VB: The time and turmoil in which we currently live is temporary, but the idealism on which this country was founded is forever a guiding light. The presidents on this CD spoke not for themselves alone, but for the nation as a whole. It is in this spirit that these works were created, and we hope that they will provide inspiration and help us remember the wisdom and humanity of the great minds that shaped our nation. Myles, you are a medical doctor, so I’m wondering how you developed an interest in writing. Is this something you’ve been doing from an early age? ML: Although I spent 40 years performing open heart surgery (I retired just under two years ago), I have a degree in art history. Straddling the arts and the sciences from an early age, I learned over the years that there is as much art in science (surgery) as there is science in some forms of art. Surgery, for example, is a series of wordless steps that must be performed in a specific sequence, like the notes played in a symphony, to reach a preordained conclusion. Artists frequently use non-conventional means such as light, magnetism, the dripping or splattering of paint, or gravity (as in advanced rock stacking, which becomes a sort of Zen experience) to abstract the essence of what confronts his or her senses. As far as writing is concerned, the writing gene is in my family. My father was a professor of English and Journalism at the University of Pennsylvania and was the first vice-dean of Penn’s Annenberg School of Communications. I remember growing up in a house with floor-to-ceiling bookcases everywhere. His twin brother was a presidential speechwriter, novelist, vice-president for programming at NBC, and television producer. His son is a professional poet and has taught the writing of screen plays. My niece is an investigative journalist and novelist. I received creative writing awards in high school and have written a novel (The Donation, a medical thriller that showcases the shortage of organ donors), a textbook (Near Misses in Cardiac Surgery) which is still selling after 26 years (both, I will add in a shameless act of self-promotion, available at Amazon), and various essays on photography and the creative process, as well as numerous scientific papers and abstracts. Have you ever thought of writing a libretto for an opera to be composed by Victoria? ML: Writing scripts for the pieces in this album (we have stretched the meaning of the word “libretto”) is one thing. Writing a libretto for a full-length opera in which the words are to be sung with the music rather than read over a musical background is quite another. I have long thought that Theodore Roosevelt’s story should be the subject of an opera and discussed this with Victoria. Roosevelt was known for his rampant exuberance, which extended to the glorification of combat, and resulted in the death of his son Quentin. Having encouraged all his sons to go to war, he took personal responsibility for Quentin’s death. It was as though his very exuberance, what I have called “the boy” in him, had been the devil that, as Roosevelt put it, “masters each of us.” The exorcism of this exuberance, the boy in him, brought on by Quentin’s death, was an agony that killed Roosevelt six months later. This is the stuff of opera! But I am not the one to write it. Having said that, I never knew I could write scripts such as the ones in this album until Victoria challenged me to do it. In order to create each one of these pieces, we mutually decided upon a subject. I then read, perhaps, 20 books of a biographical or autobiographical nature, and perused speeches, writings, and letters to confidants or children, and tried, within 400 to 500 words, to present the conflict (or adversity) that the subject had to transcend in order to achieve the success he did. Once I presented Victoria with a script and explained what I was trying to bring out, she told me, as she began to write the music, that I could re-arrange some furniture within each “room” or section, but that I could not alter the overall architecture. She reserved the freedom (and rightly so) to eliminate or alter some of the text if that would facilitate her musical expression of my words. For example, I had worked on the Jefferson piece for about two years and had come up with what I thought was a good portrait. Victoria was not satisfied that I had “humanized” him enough, that I had lapsed into “pure history,” with which we were only too familiar. I was dismayed, but she was absolutely correct. In two days, I completely transformed the text to what it is in this album. The text now retains the history I wanted, but also incorporates, through the use of a repetitive device (“Yet there he stood”) the profundity of the conflict Jefferson felt between his professional and public personae. I learned how deeply this conflict affected Jefferson by revisiting a reference I had not studied in enough detail. Changing the entire character of the script enabled Victoria to produce the profound range of musical expression that is so striking in the Jefferson piece. I get chills every time I listen to it. I note that you are also a professional photographer, as well as the president of the Los Angeles Doctors Symphony Orchestra. Beyond wondering how you manage to find time for all these disparate activities, I have to ask if you also play an instrument, or perhaps even compose music? ML: I am not a musician, nor do I compose music. What I play on the piano or guitar is something no one would really want to hear. But to me music is the most immediately powerful of the arts, not only in and of itself but in relationship to other arts. Imagine my words in this album, blended with those of the various presidents, read without the anticipatory or reactive declarations of Victoria’s powerful musical expression. Or a screenplay without music to set the emotional tone of a scene or an expression (think of Rocky conquering the steps of the Philadelphia Art Museum in dead silence without Bill Conti’s rousing theme in the background). I have used music as background for slide shows of my photography in Carmel, California, and on one occasion brought two members of the audience to tears. I think that wouldn’t have happened without music (one of my secret wishes is for Victoria to compose a piece based upon my photography, but don’t tell her). It was she who suggested we use one of my photographs for the cover of this album, a seascape that in this context is meant to suggest a waving flag. My photography has become a consuming passion since I retired from the active practice of heart surgery (see @mylesleephotography on Instagram). Like surgery, photography is a lonely job. As in other arts, fine art photography is what the photographer decides to abstract from what confronts his or her senses. Painters and writers do the same thing. The truth, of course, has to be a collaborative effort between the artist and the observer. The truth, in any art form, is what the artist and observer, jointly and yet independently, choose it to be. This process, I suppose, is how beauty becomes truth, and truth beauty. How I came to run the Los Angeles Doctors Symphony Orchestra is another detour in my journey through life. Suffice it to say that I have been at it for five years, and I haven’t been given the bum’s rush! Fanfare readers will be interested to know how you chose our veteran critical colleague Henry Fogel to be one of the narrators on this project. VB: I have known Henry Fogel for many years and have always admired his vast musical knowledge and his great leadership qualities. He was the one I turned to with the idea of the four presidents CD, particularly since the school where he was dean for many years is called Roosevelt University. He was enthusiastic and shepherded this project through to its present form, making it possible to work with the extraordinary musicians of the Chicago College of Performing Arts. He personally arranged for the premiere performance of each of these works at the University and for each of the recording sessions. Without Henry this music and this CD would never have happened, and I am deeply grateful to him for his belief in the project and his perseverance in seeing it through to the end. In addition, he happens to have a beautiful speaking voice, having been a radio announcer in his youth, and as narrator his voice lent a profound depth to the title track, Soul of a Nation. This CD is a tribute to Henry Fogel. ML: We both were deeply affected by Henry Fogel’s profound performance as narrator in Lincoln Portrait when we heard it in Ganz Hall at Roosevelt University in 2012. Given this, and his enthusiastic backing of Soul of a Nation—the entire project—in his capacity as dean of the Chicago College of Performing Arts, Victoria and I simultaneously and unreservedly concluded that he must take an active role in his own project. It was our way of thanking him for an unprecedented opportunity. At a time when presidential matters seem continually to dominate the news headlines, it is salutary to look back at previous incumbents of the American Presidency who are considered to be game-changers. 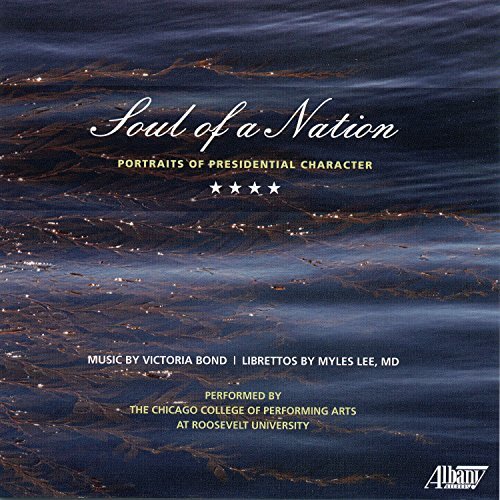 Composer Victoria Bond has stepped up to the plate with this fascinating concept: In conjunction with librettist Myles Lee, MD, she has produced a set of four works, all with narrator and each spotlighting a solo instrument, to honor four presidents who played decisive roles in American history. Jefferson (Soul of a Nation) embodied the soul of our nation in the Declaration of Independence. Franklin Roosevelt (The Indispensable Man) saved our Republic and the free world from despotism in World War II. Theodore Roosevelt (The Crowded Hours) enabled us to become a world power. George Washington (Pater Patriae), despite fighting more battles lost than won, made independence possible. Victoria Bond is director of Cutting Edge Concerts New Music Festival in New York (which she founded in 1998) and frequently lectures at the Metropolitan Opera and the New York Philharmonic. She is a conductor as well as a hugely talented, sensitive composer. It is difficult to imagine tighter performances than these; the recording, too, is top drawer. The first piece, Soul of a Nation, A Portrait of Thomas Jefferson, takes its title from positing that independence, religious freedom, and education are indeed constituents of the soul of a nation. The music is tender, a sighing phrase providing a thread throughout. The solo violin of the beautifully sweet-toned Frank Almond acts as the perfect foil for narrator Henry Fogel, recently retired dean of the Chicago College of the Performing Arts at Roosevelt University. There is a sense of yearning to the violin lines; Almond’s expressivity comes into his own in the brief cadenza before the frenziedly determined moto perpetuo passage that transforms that sighing gesture. Over the space of some 20 minutes, a huge emotional journey is traversed. Fogel delivers the text with authority; the violin seems to translate the words and sentiments into a soliloquy of its own. Fabulous! The second president to be honored here is Franklin Roosevelt in The Indispensible Man. In this piece, a clarinet is the instrumental protagonist. The sense of joy at the opening, with the jazz-inflected dotted rhythms veering sometimes towards big band territory and sometimes threatening to head into Ives’s thickets, is completely distinct from Jefferson’s piece. Clarinetist John Bruce Yeh, who has come my way a couple of times before in Fanfare, is clearly blessed with a perfect technique, so confident is his delivery. The narrator, opera singer David Holloway, delivers the text with inspirational uplift. Franklin Roosevelt’s personal battle against polio became a metaphor for his battles against the Great Depression and the threats to the free world posed by Nazi Germany, Italy, and Japan. The title refers to his statement that “there is no indispensable man,” and yet he became one. The invocation of jazz here is brilliantly done; a special word of praise is in order for the accuracy of the trombones of the Chicago College of Performing Arts Wind Ensemble. On, now, to Theodore Roosevelt in The Crowded Hours, wherein narrator Ray Frewen is joined by trumpeter Mark Ridenour. Optimism characterized him until he faced the death of his son Quentin in World War I. There is a Stravinskian circus tinge to some of the writing, which is delightfully deft. Chicago-based actor and director Ray Frewen has just the right lilt in his voice to convey the positivity portrayed here; trumpeter Mark Ridenour is a clarion-clear co-soloist. What characterizes Bond’s music is its sonic clarity: She knows exactly what she wants to say, and has the ability to create that sound. As the music becomes more conflicted, one senses Roosevelt’s anguish about his loss; that Stravinskian edge is blunted, fragmented, and deconstructed. All credit to Ridenour for his confidence in the final flourish. Finally, there comes Pater Patriae and Washington. Bond pays tribute to that president’s courage and moral clarity, foregrounding the flute (the brilliant Gabriela Vargas) as a solo instrument. Tunes such as Yankee Doodle surface before the music thins to a thread. Narrator Adrian Dunn, a pupil of David Holloway’s (Dunn has also composed a hip-hop opera, HOPERA) has a fairly light voice, enabling contrasts between the narrators’ voice types. There was also an element to Washington of the reluctant hero, and indeed the music does repeatedly interiorize a reduction in lines, giving the music a pensive quality. The close has an element of enigma about it, as if to usher in another portrait that is yet to come. Newer PostClassical Candor reviews "Ragtime in Washington"